A not-to-be-missed artwork available are the original sketches of Kelantanese batikpainting master, Ismail Mat Hussein. His expertise is bringing the traditional Malay living norms to life through his arts and crafts rendered in mosaic-like compositions. 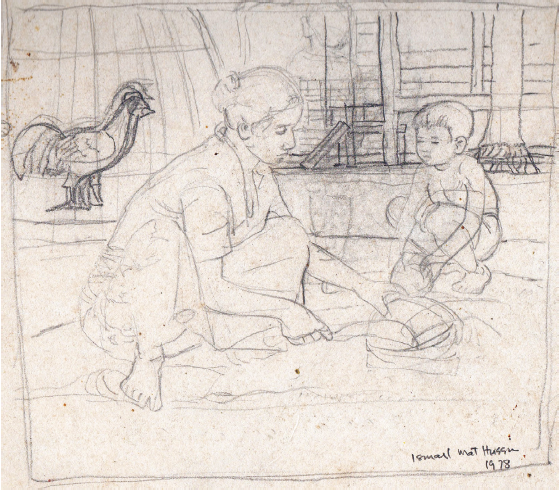 The following sketch however, is amongst his art in the works, featuring a mother getting ready to prep something of some sort while her child observes her outside their home. The wooden house and the rooster accompanying the mother and child signifies that their home is situated and set in a rural village.